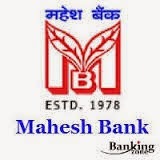 AP Mahesh Bank Recruitment 2015 – Apply Online for Probationary Officer Posts: AP Mahesh Co-operative Urban Bank Ltd has issued notification for the recruitment of Probationary Officer vacancies. Eligible candidates may apply online from 31-03-2015 to 13-04-2015. Other details like age, qualification, selection, fee, how to apply are given below…. Age Limit: Candidates age should be 28 years as on 31-03-2015. Age relaxations are applicable as per rules. Selection Process: Candidates are selected based on their performance in Online Test & Interview. Application Fee: Candidates should have to pay Rs. 600/- (Non refundable) payment can be made by using Debit Cards (RuPay/ Visa/ MasterCard/ Maestro), Credit Cards, Internet Banking, IMPS, Cash Cards/ Mobile Wallets. How to Apply: Eligible candidates may apply online through the website www.apmaheshbank.com from 31-03-2015 to 13-04-2015. Start Date for payment of Application Fee: 31-03-2015. Closing Date of Online Registration Gateway: 13-04-2015. Last Date for Payment of Application Fee: 13-04-2015. Date of On-line Test: 17-05-2015.